The success of a wedding event is all about how well the preparation took place. Do not expect a well-executed occasion tomorrow if you will only start outlining the event proper today. Most wedding preparations may take place for a year and a half depending on how grand the event will be. This whole preparation period must be taken seriously as soon-to-be-marrieds still need time to relax and enjoy the wedding week. 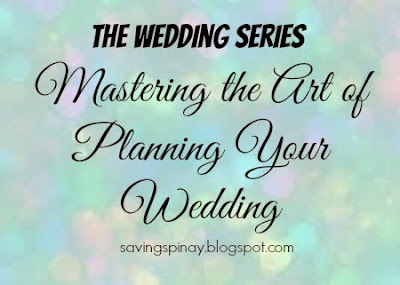 So how do you start planning for your wedding?! Don’t underestimate the value of planning! When you have enough time to plan for your wedding then you are most likely to have a better outlook as to what you want your wedding to be. A good six (6) months to 1 and a half year will be very good as a preparation period. How much are you and your fiancé willing to spend for the wedding? Estimate the money involved so that you have a direction as early as the planning stage. Remember that it’s better to have a surplus in the budget rather than deficit. Take time in finding your suppliers. Go for those who have three or more years in experience. Experience in events is the best teacher and if that supplier has a little experience then he/she will find it hard to adjust on emergency situations. This is a big tip to you all- prioritize the people who matter. Your guest list will speak a lot for your wedding. We Filipinos are very sensitive when it comes to not being invited in an event most specially, wedding! Filter your guests from groom’s’ side to bride’s side well. Be strict for RSVP and be honest to your guests! Since a wedding is an investment bear in mind that you will spend depending on how you imagine your wedding will be. The simpler means the cheaper but do not go for the price tag. Always aim to have the unique wedding that you can proudly say that it’s yours! Be creative and try the DIY things coming in different sites that can save you a lot of money but will still make your wedding one of a kind. Preparing for your wedding is a must for it can build a good foundation for your memorable day. It is the number one key to lessen your wedding expenses as when you take time in preparing your wedding, you can better choose your event suppliers. There are issues too that can only be avoided once the wedding of yours has undergone further groundwork. Remember though that you can not depend on the preparation at all. You have to be able to make good decisions and have the strong goal to make your event well-executed. As the saying goes, prevention is better than cure. Same goes with preparation. How well you make time to prepare for your event will speak so much on your wedding day! Excellent tips for wedding planning! Actually I want to know some good pointers on how to set and stick to budget for any event planning. All I the events I did, had their budget shoot to 1.5x to 2x. Don’t know if fault lies in my planning or generally it happens!